Monnit CEO, Brad Walters was recently featured in an expert interview by M2M Apps regarding the wireless sensors market and recent developments. To read the full interview click here. If you’re looking for some interesting uses of sensor technology, take a look at the Axia ® Smart Chair. The Axia Smart Chair monitors a user’s seated posture and provides feedback where necessary. More and more people perform their work sitting down. But the human body is not designed to sit for prolonged periods. Let alone sitting ‘incorrectly’ for long periods. Good support is therefore essential, and that places major demands on the set-up of a VDU chair. Most people pay far too little attention to this. They often fail to realize sufficiently that health and a proper seated posture are intimately linked. Awareness is frequently gained only after physical problems arise. Verizon Communications can generate hundreds of millions of dollars of revenue in coming years from wireless services beyond the mobile phone, in areas ranging from healthcare and automobiles to energy management, the company’s top executive said on Monday. The No. 1 U.S. mobile carrier joins other companies expected to debate and demonstrate the benefits of connecting devices – like cars – to the Internet at this year’s Consumer Electronics Show in Las Vegas. Operators like Verizon (New York, USA) consider this an important new business. “It’s safe to say this is a market potential of billions in the 2020 timeframe,” Lowell McAdam told Reuters in an interview. This should translate into a market with “hundreds of millions of dollars in revenue for a company the size of us,” he said. Chipmaker Qualcomm and mobile network operator AT&T have teamed up on an M2M development platform they say will be available to developers in the second quarter of 2013. Based on Qualcomm’s QSC6270-Turbo chipset, the “Internet of Everything (IoE)” platform – as it is described by Qualcomm (San Diego, USA) – is intended to accelerate the development of a wide range of applications and devices for use on “the AT&T (Dallas, USA) mobile internet”. Qualcomm says the platform is an ideal starting point for creating products and applications in verticals that include tracking, industrial controls and healthcare. So, how do you ensure that your pipes don’t reach freezing temperature and know if there has been a break? 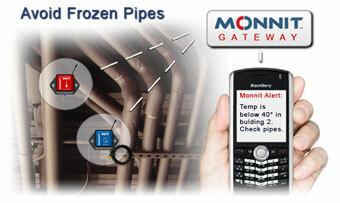 We recommend using Monnit’s affordable wireless temperature sensors and wireless water sensors to monitor the temperatures around your water pipes and know immediately if there is a broken pipe leaking. There are no wires to worry about, and the setup process is amazingly simple. The following steps will guide you through the process of exporting any Monnit Humidity sensors’ data and modifying the spreadsheet in Microsoft Excel to show separate values for humidity and temperature. This is useful if you are looking to chart the humidity and temperature data independently. To get started, log into your wireless sensor network account on iMonnit (www.imonnit.com) then select the humidity sensor from the “Sensor List” that you would like to export data for. Set the date range you want to export data for by clicking in the date box at the top right of the sensor information window, then select the export tab. Choose “Include Data from This Sensor” then click the “Export Data” button to save the .csv file to your computer.